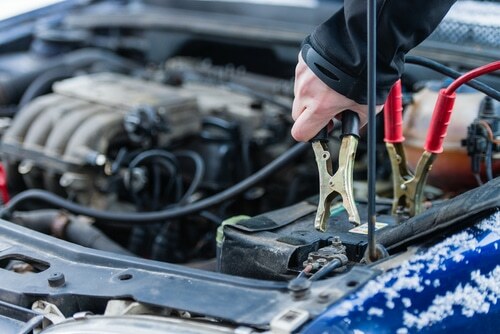 A faulty battery is the most common reason for a car to break down. If you have ever been stranded because of a dead battery, you may wonder why the weather has such an effect on it. Once you know why car batteries die, you can take action to prolong the one in your car. Evaporation: Under the hood, a car battery can reach internal temperatures of 140 degrees or higher. This causes battery fluid to evaporate, which damages the battery’s internal structure. Overcharging: High heat can also cause the voltage regulator or other charging system component to malfunction and overcharge the system. This leads to a slow but inevitable death for your car battery. Corrosion: Extreme temperatures allow lead plates inside the battery to corrode and deteriorate. Reduced capacity: At 32 degrees, battery capacity drops by 20 percent. At -22 degrees, capacity drop by 50 percent. This capacity reduction lowers the battery’s power output, impeding its ability to start the car. Thicker engine oil: Cold temperatures make engine oil begin to solidify, making the engine more difficult to turn over. This forces the battery to work even harder at a time when capacity is at its lowest. Reduced recharge rate: When you drive your car, the battery automatically recharges. However, the recharge rate is slower in lower temperatures, meaning you need to drive further to fully charge the battery for a successful restart. Load increases: You tend to run your headlights, heater, windshield wipers, defroster and seat heaters more in the winter, increasing battery load and exacerbating the reduced recharge rate problem. You can’t control the weather, but you can still take certain steps to prolong car battery life. Keep the battery clean. Dirt acts as a conductor, which drains life from the battery. Corroded terminals also increase insulation and inhibit current flow. Invest in a modern battery conditioner/intelligent charger. This is most beneficial if you tend to only drive around town or leave your car standing for days at a time. A battery conditioner prolongs battery life without overcharging it. Turn off everything in the car when you park. Headlights drain a battery the fastest, but interior lights and the radio can also kill the battery if left on for hours. If your battery is the type that needs to be topped off, check it regularly during the summer and add distilled water when needed. Watch for certain signs of a weakening battery to prevent becoming stranded. Consider replacing your battery or having it checked if you notice these signs. Headlamps and interior lights appear dimmer than usual. In-car accessories fail to operate. The “check engine” or “battery” light is illuminated. The battery is more than five years old and it struggles to start the car in freezing conditions. At Scott’s Fort Collins Auto & Repair, we offer free car battery tests to put your mind at ease or let you know it’s time to buy a new battery. It’s certainly much more convenient to replace a dying battery during an appointment than to get stranded somewhere once the battery dies. When you replace the battery, be sure to choose one with a rating equal to or higher than the original. We can help you make the right selection. To learn more, or to schedule a free car battery test, please contact us online or call us at (970) 682-4202.